The Transit Tourist takes a look at other transit systems across the globe from the first person perspective of a visitor. What can Metro learn from how these other systems treat the uninitiated – and often bumbling – tourist? Last month I took some time off for a jaunt across the pond to Europe – specifically the cities of London, Amsterdam and Paris. While strictly a pleasure trip, it’s impossible to visit Europe without finding yourself immersed in mass transit, and typically at a scale that’s all but unseen here in the States. For a transit blogger it turns a vacation into inspiration for a new series, one I’m calling The Transit Tourist. Here’s the plan: whenever one of The Source bloggers takes a getaway – be it to the largest cities in Europe or to a small town in America’s heartland – and hops on board the local transit system, we’ll come back with a report of the experience and a some thoughts on what Metro can learn from how things are down elsewhere. The tourist experience on transit is a unique but important one. Tourists generally have different needs than the daily commuter, but my feeling is that when a tourist’s needs are met a transit system is doing a good job at two things: providing an easy to use system that also serves many destinations. In other words, if a system works for an outsider, it’s probably going to work for local residents as well. Source: Wikipedia and Transport for London. One of the most important transportation moments for a tourist is the airport transfer. You’ve just arrived to a new city after a long flight, how do you get to your final destination? On this trip, I flew into Heathrow Airport, one of London’s five area airports (each served by some form of rail). The London Underground’s Piccadilly Line directly serves Heathrow with three stations at the airport serving the various terminals. It’s a feature that’s well publicized – and since the stations are inside the terminals, you’re not going to get lost looking for your connection. London Tube map. Take note of the numbered Zones 1-9. How long does it take to get from the airport to London proper? London’s transit system is divided into nine zones that radiate out from the central city. Heathrow is in Zone 6 and a trip to Zone 1 (Central London, aka the good stuff for tourists) takes at least 50 minutes. The distance from Heathrow to Central London is approximately the same distance as LAX to downtown L.A. The zone system makes for an incredibly complicated fare system (take a look at this chart if you don’t believe me), but purchasing an Oyster card (London’s version of the TAP card, more on that later) greatly simplifies things. A trip to Zone 1 from Heathrow with an Oyster card will cost between £2.40 and £4.20 (around $4 to $7 respectively) depending on whether or not you’re traveling at peak hours. In my case, I was actually going to be staying in a Zone 4 suburb called Hendon (if Central London is downtown L.A., then Hendon would be North Hollywood). This trip requires a transfer to the Northern Line in Zone 1 for a total trip time of about 1 hour and 30 minutes. 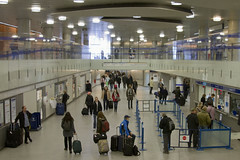 Travel on the Underground from Heathrow isn’t neccessarily fast, but it is convenient and affordable. Read on about London fares, the Oyster card, customer service and more after the jump. Speaking of affordability, while a $7 trip from the airport is a deal (the LAX FlyAway is also $7 ), London transit on the whole can be a very pricey affair. According to Tree Hugger, London has the highest fares of any transit system in the world. As I loaded up my Oyster card with a 7-day pass for Zones 1-4 this became obvious. The slick touch-screen ticket vending machine displayed the amount due: £36.80. That comes out to about $57! Even if you stick around Zone 1 and 2, the cost still comes out to a steep £25.80 (about $40). For point of comparison, the Metro Weekly Pass recently increased to $20. 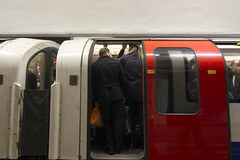 And London isn’t immune to fare hikes – prices will be increasing in 2011. The good news is that a 7-day pass in London is good for seven days from the day of purchase, unlike the Metro Weekly Pass which is tied to the calendar week. Bus fares are slightly different as buses don’t use the zone system. With an Oyster card, single fare on a bus is £1.30 (about $2). A 7-day pass is £17.80 (About $28). 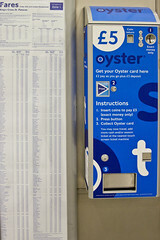 Oyster card vending machine. Exact change required. More on the Oyster: it’s excellent. Many London Underground stations have ticketing counters manned by actual humans that can sell you an Oyster card (for a £3 refundable deposit plus any credit/passes you add) and stations also have vending machines that sell Oyster cards. In other words, tourists have no problems getting hold of one. Oyster cards feature the much requested “cash purse” feature currently absent from TAP. As a tourist I found it easier just to load up a 7-day pass and not worry about it any more, but the feature is there and it’s full realized – including daily price capping which ensures you’ll never pay more each day than the cost of a Day Travelcard (the equivalent of Metro’s Day Pass, it starts at £5.60 or about $9). It’s worth noting that both the Oyster card and TAP card are manufactured by the same company, Cubic Transportation Systems. It’s no secret that the London Underground, also known as the Tube, is one of London’s many crown jewels. Over half the lines were opened before the turn of the 20th century (the Metropolitan Line opened first in 1863!) giving it the unique designation as the first urban subway system in the world. Despite its age, the London Underground is a thoroughly modern rail system. These signs do one thing and they do it well: tell riders when their next train is arriving. Trains run frequently and the network is vast. Very rarely did I feel like I had to wait for a train — they seem to come by every few minutes, and highly visible electronic signage at every station tell you exactly when the next few trains will be arriving. The trains, quite simply, go everywhere – the most distant station in Zone 9 is about 29 miles from Central London. They hit every spot you’d ever want to visit in Central London and they network in such a way that transferring to a different line rarely feels like a hassle. One reason transfers are so easy, aside from the frequent service, is that the cavernous stations often have vast pedestrian tunnels connecting the lines that make the transit experience seamless even though you’ve actually done quite a bit of walking. The stations themselves are relatively nondescript visually, and many are showing their age, but the most important visual elements – the wayfinding signage – are second to none. Signs are bold, simple and descriptive. One of my favorite signage elements are the massive line maps on the walls of the tunnel opposite the platform. They let riders know exactly where they are and exactly where the train they’re waiting for will be going. Inside the trains are some of the most plush seats I’ve ever had the luxury of siting on in a transit vehicle. During peak times however, you’ll be hard pressed to get a seat – or even a cramped space on the train. Despite massive 8-car trains and frequent service, these trains can get CROWDED. Like: I’m not squeezing into that tin can crowded. Or: I’d rather be on a Rapid 720 during rush hour crowded. During my trip there were a number of times I chose to wait it out, often letting five or six jam packed trains pass by, rather than deal with the discomfort of the crowds. And those crowds spill into the stations, where you’ll experience London’s version the standstill on the 405, but with human beings instead of cars. On weekends, service seems to go haywire, with lines and stations completely closing. According to locals, it’s just a given. Riders are given fair warning, but it happens nonetheless. A big surprise for a world-class city with world-class night life and a world-class subway system is that the entire London Underground shuts down completely around 12:30am and doesn’t open again until 5:30am. Does anything say "London" more than a red double decker bus? Just as iconic as the Tube are London’s buses, and unlike most cities, in London you’re just as likely to see tourist on a bus as on a train. This tourist rode a number of buses and if there’s one thing that stood out most about London bus service it’s this: London buses are the cleanest buses I’ve ever seen. Maybe all those CCTV cameras have turned the populace into a docile sheep, maybe teenagers don’t rebel in the U.K. or maybe Transport for London requires the bus operators to hire the best cleaning crews on earth – all I know is that I didn’t see one mark, one scratch or one gummy residue on any bus I rode on. And that alone made the bus experience a great one. This bus is clean. Really clean. Scary clean. In addition, buses seem to run frequently – I didn’t find myself waiting longer than 15 minutes for a bus to show up. Bus stops run the gamut from your standard pole in the ground to stylish glass shelters with electronic signs displaying next bus information. Even the standard bus stop signs are really well designed with routes listed as a grid of squares – yellow squares indicating routes that require tickets to be purchased before boarding (available from vending machines at the stop). Loads of Transport for London staff to help riders plan their journey. Transport for London really shines when it comes to customer service, especially on the Underground. All stations are staffed and staff is extremely attentive. At one point during my trip I ran into a problem with my Oyster card. I tapped it at the fare gate but it reported an error and I couldn’t pass. Immediately a Transport for London staffer approached me, walked me over to a ticket machine, diagnosing and solving the problem in no time (I had managed to exit a station the previous day without “tapping out”). Another time I was simply looking at a posted Tube map for my own pleasure. It didn’t take more than a minute for a staff member to approach me and ask if I required any assistance. The P.A. system is used constantly and to great effect. Train delay? Large crowds? Station closures? Passengers are always in the know. Vast rail and bus system with frequent service. Oyster card makes a potentially confusing fare system easy for anyone. Direct airport rail connection that links not only to the central city but also to other rail lines makes taking the train a no-brainer for visitors. 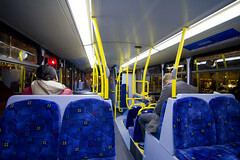 Trains, stations and especially buses are immaculately clean and free of graffiti. Transit oriented everything – London wouldn’t be London without it’s iconic buses and trains. And extra points go for how much value Transport for London places on that iconography. Unfortunately, good transit is crowded transit and during peak hours it gets VERY CROWDED. You get a lot of transit for your buck, but still… almost $60 for a week pass left me with some sticker shock. 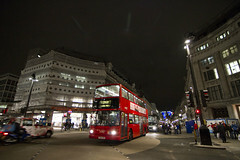 The Tube shuts down surprisingly early, but there are over 100 night buses to make up for it. Sure, London has an almost 130-year lead on L.A. when it comes to urban rail, but that means we have a great template to work from. The lines of the Tube were originally built and run by different and competing operators and London has managed to create a cohesive network out the mess. The Oyster card is TAP done right. It’s the same technology, same manufacturer, same concept. It’s time to look at London and copy what they’ve done with Oyster because it just works. Tourists don’t always visit on Sunday and leave on Saturday. Passes should be tied to date of purchase, not the calendar. Sprawling train stations with many portals (entrances and exits) and tunnels leading to connecting transit are a good thing. A good transit system with an iconic visual identity can make a system that is synonymous with the city. I think Metro’s on the right track with this, but it’s worth remembering. Consolidate services under one brand. London buses are actually run by a large number of private operators, but a rider would never know that. Wayfinding signage is the most important piece of station art. Customer service should be downright excessive. Plush seats are nice, but not essential. You forgot to mention when the crappy europeans trains breakdown are are held outside the station due to signal failure and you sit there for 25 minutes with no air crushed by everyone and also if you go and sit upstairs in the back of the buses you will see all the scratched glass and marker graffit and damage much like you would see at the back of a Repid liner instead of the front. Thanks for your input John. I actually didn’t experience any of the train breakdowns you mentioned – but I’m sure they happen. As for the scratched glass/graffiti on the buses, I just realized that despite being a tourist I never did go up the the second deck of any double decker buses I rode on. How about the frequency? If you missed a train, how long did it take you for the next train to arrive? That’s the key here in successful transit agencies like London and Tokyo: you miss a train, the next one comes a tad later, not twenty minutes later! Where you able to top up your OysterCard with cash value instead of passes too? And were they easy to do like going online (try San Francisco’s Clipper Card next time, they got it right; and much closer to LA too, oh yeah they also use the same vendor!) Yeah that’s right, nobody else in the world locks up that feature!! How large were the fare gates? Were they large enough to fit your suitcase through? I’m saying this because the turnstile you guys have at the Aviation/LAX station is a joke. You expect people to use that to get to LAX but the darn turnstile can’t even get the smallest of carry-on bags through. Fare structure complicated and expensive? Gee, what a shocker, why do you think places like London and Tokyo are able to keep them running self-sufficiently for DECADES (even before the tap thing) instead of the flat rate $1.50 anywhere you go no matter how far you ride? Flat-rate subsidized transportation just doesn’t work; you need profit to earn money which in turn can be put back to make better improvements. This model has been in place all over the world, it’s time LA implements this too. I’m sure a lot of people will be willing to pay $5-10 STANDING if you guys can get me from LAX to Sherman Oaks in ten minutes on rail rather than continued reliance on buses which can take forever depending on traffic jams. I’d take a crowded train that can get me where I want to go in a couple of minutes over a crowded bus which gets stuck in traffic, over a traffic jam on the 405. I’m willing to pay more for the convenience of getting there fast even though it means more crowds. Oh, how were the seats aligned on the Underground? Did they all face the same perpendicular way like how our Metro does which doesn’t add much aisle space and frequent “excuse mes” to get off the train, or were they aligned parallel so people can seat and stand more easily? Frequency on the trains, as I mentioned in the article, is impressive. Trains come by every few minutes barring unplanned delays. 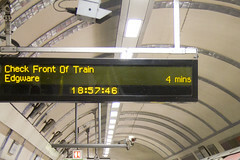 The Tube line I used most regularly had service of 2-6 minute during the week, and on weekends it would vary between 2-9 minutes. Oyster card does allow for cash purse. Didn’t use the online service, but the website certainly looks user-friendly. I do know that adding value online (this goes for San Francisco Clipper too) is NOT instant. It seems that with all Cubic’s smart card technology, adding value online involves a latency period of at least 2 days. Fare gates in London are not turnstiles but retractable flap barriers – which I find easier to transport luggage through than traditional turnstiles (which Paris uses). It’s worth noting that while Transport for London does enjoy a high farebox recovery ratio, it is NOT profitable. According the TfL 2010 Annual Report, London Underground fare revenue was £1,795m while expenditures £2,301m (78% farebox recovery). For buses fare revenue was £1,560m while expenditures were £2,607m (59% farebox recovery). Lastly, seats on Tube trains face each other and offer aisle space, although I noticed that when trains crowded passengers tended to avoid the aisles between the seats and just bunch up near the doors. Perhaps because seated passenger faces end up at about crotch level? Next up, try other US cities like San Francisco, Boston, Chicago, New York, Seattle, St. Louis, Philadelphia, Baltimore, all of which HAVE DIRECT RAIL LINES TO THE AIRPORT!! C’mon, it’s a shame that the 2nd largest city in the US with all that traffic down at LAX doesn’t even have a decent rail line. Try Vancouver, Canada where they made things right by adding the new Canada Line to/from Vancouver Int’l Airport into the city; things that made Olympic officials wow instead of the instant fail we get when they see the horrendous traffic jam upon arrival. Try Paris and Frankfurt which had the obvious idea of adding a high speed rail station link to their airports to eliminate the need to fly regional jets to nearby cities when they connect through there. LAX is already crowded as it is, it’s much easier to add the new CAHSR station there so people coming into LAX can then connect directly there to places like San Diego and Las Vegas instead of schleping their heavy bags all the way to LA Union Station. You betcha SFO is gonna beat LAX as the prime California airport; they have plans to build a direct CAHSR station there. Try our sister city of Athens, Greece which has a great transportation system to/from Athens Elefthérios Venizélos Int’l Airport into the city with lots of trams and subways crisscrossing the polis. And finish it off where public transportation is the best in the world: Tokyo; Metropolitan size same size as LA County, same earthquake prone city as LA, yet they have the most efficient transportation systems in the world, keeping 33 MILION in the Kanto region on the go everyday. 1. Distance based fare is a good idea… embrace it! The Bus Rider Union will be up in arms over this but London’s subways (like Tokyo) has distanced based fare. This will encourage people to use transit more frequently for short trips, which is especially a problem for LA where people get in cars to go to Starbucks barely 1 block down the street. 2. Logical train station names. A quick guess where the “Piccadilly Circus” station is located? Answer: Piccadilly Circus. How about “London Bridge” Station or “Waterloo” Station? They are located at where you’d expect to find London Bridge and Waterloo district. Now let me ask you where is the “Memorial Park” station in LA’s Metro system? What if I tell you that it should be called “Old Town Pasadena” station? Doesn’t that make 100 times more sense? Or try this one – Say you want to go to Koreantown… you’d have to know that K-town is roughly located at Wilshire/Western. But taking public transit shouldn’t require an advanced geographic lesson. Why can’t Wilshire/Western be called “Koreatown station”? 3. Logical names for rail lines that tells people where the train goes. I’m beating a dead horse here but I hate the name “Purple Line”. It’s the Wilshire line. 4. Bus maps that look consistent and make sense. At most London bus shelter, there is a big map that display all the lines that service that stop. But it is produced in “subway” style with the top always indicating compass North. Basically, the important stops on these bus routes are displayed like subway stations on a rail line (but not in true geographic scale), and the map shows you how you can transfer bus to get to your final destination (just like a rail map). Now look at LA… there are no bus maps at bus stops. And the online maps are hidden behind PDF files (which is mostly inaccessible by phone). And worse of all, none of the maps are linked together and most of them do not follow a compass North orientation. You wouldn’t know that you can transfer from 720 to 704 at Wilshire/Santa Monica to go to Century City if you are exiting the “Koreatown” subway station. And yet, London does this in an almost seamless and intuitive way. Good comments. One note about Station names: while I agree that there could be more consistency with station names (for example, why is Memorial Park not called Holly Street/Arroyo Parkway station? ), some of your examples exhibit some problems. If Memorial Park (which is a real location, located adjacent to the station) is the “Old Town Pasadena” station, then what is the Del Mar station? Similarly, if Wilshire/Western is the Koreatown Station, then what are Wilshire/Normandie and Wilshire/Vermont? Koreatown 1, 2 and 3 stations? Ken, you forgot Washington and Portland as cities with direct rail access to the airport, Atlanta too. But Boston doesn’t have rail access to the terminal, the T stops outside the airport and there’s frequent free shuttle service to the terminals (a lot like LAX, except a bit shorter ride). You also forgot Burbank, which has commuter rail access across the street, like the commuter rail access to Philadelphia’s airport. The difference is that trains to Philadelphia run every 30 minutes, while Burbank is subject to the quixotic Metrolink schedule. I’m glad you enjoyed your trip to London. I have lived in London or Paris all my life and only use public transport. I am also a very frequent visitor to LA and a big admirer of your growing transit system and especially of your commitment to it (via such things as Measure R). You’re right in identifying some of the London features from which LA could benefit: 7-day passes and not Sunday to Saturday ones; better signage and maps everywhere to mae the system user-friendly which it really isn’t; the more flexible Oyster Card. I’d also add service frequency, particularly on rail lines, but if the usage is not there, I suppose you can’t expect Metro to run empty trains. On ‘brand’ I actually think Metro is pretty good already. You’re very aware of the distinctive M symbol everywhere in LA and see bus and rail and part of a single system. But it is very confusing and very irritating that a tourist (or, more to the point an Angelino) can’t use municipal bus lines and Metrolink trains (in LA county) on TAP, as you can on the London equivalents. I know commuters have EZE, but it’s not the same thing. There are things London could learn from LA too. I don’t know how we’d ever implement it (and perhaps the tube takes our longer distance traffic anyway) but your system of Rapid Bus Lines is. I wish you’d travelled on the new eastern part of the Jubilee Line (between Westminster, through Docklands to Stratford) which opened in 2000. It’s very hard to believe the station architecture wasn’t explicitly modelled on the LA subway. I once sent some pictures of my local and neighbouring stations to Steve, so ask him for a look at them. It’s a little daily reminder for me of LA! You might also have liked Docklands Light Railway (privately owned and run but part of the Oyster scheme) which has a large system in East London. The trains run above ground like LA’s Green Line, and the views of Docklands are fantastic. As the trains are automatically driven, you can sit right up front. Thanks for the comments Martin, and glad to hear that you appreciate what we’re doing here in L.A. I actually did ride on the Jubilee Line and was very impressed with the modern features of the stations. I took a few pictures of the Southwark Station that other readers might interested in. The most amazing feature to me are the glass barriers along the tracks with automatic doors. Something like this prevents the rare but unfortunate and disruptive existence of “jumpers” (something we faced in L.A. just last week). I wish I had the chance to ride the DLR and the Tramlink for comparison to L.A.’s light rail. I have visited LA over 50 times since 1982 and can say that the transit system there has improved dramatically. I’m an American expat from Tokyo living in Los Angeles now, still going back there twice a year. For what I know, everytime I go back to Tokyo they have added more rail and made much faster technological improvements than Metro, despite the cost of construction is much higher than the US. Distance based fares has always made sense to me ever since I was an American child growing up in Tokyo. Even buses in Japan had distance based fares and they did it efficiently even before this whole contactless card system was the norm. I enter from the back of the bus and I take a ticket which is stamped with a certain number. As the bus runs through its route, the display shows what each passenger has to pay with regards to each stop based on the odometer of the bus. Say if I took Bus #123 at bus stop #7. I take the ticket from the machine which has the stamp #7 on it. If I get off at bus stop #10, I look up the display and it tells me everyone who got on at bus stop #7 has to pay X amount if they’re getting off at this stop. Japanese buses also give change too so if you don’t have exact change, you put it into the fare box and it gives you change. Remember; this was done before they had contactless; and it worked! Now people in Tokyo just tap in and tap out of buses, trains, trams and subways with their Suica or PASMO cards and it automatically deducts how much fare to deduct from the topped up card. If I take a Toei bus from Ginza to Harumi Port, my Suica card does everything for me; I get on from the back of the bus, tap in, when I get off from the front, I tap out and my Suica has deducted the proper fare amount depending on the distance I rode. Why can’t Metro buses be more like this? It made no sense to me how you guys are able to maintain profit. It makes more sense to have distance based TAP implemented not just on Metro rails, but on buses too. It makes no sense how one person can ride Metro 320 for two stops to pay the same $1.50 than another who rode it end to end. You only make $3.00 from this. Let the person who rode it for two stops pay $0.50 (makes sense, shorter distances = cheaper price) and let the guy who rode the bus end to end pay maximum cap of $3.00. Walla, you just earned an extra $0.50 instead of flat rate fare. In Japan, like London, are named after the area and the direction they are in relation to it. For example, there’s many subway stations around Shinjuku, but they are named in relation to where they are: Higashi-Shinjuku literally means “East Shinjuku” in Japanese. Simple, that means if I get off there, I end up in the eastern part of Shinjuku. You mentioned how Koreatown stations should be named; called it Koreatown Main, East Koreatown, etc. Use you imagination; don’t call it Hollywood/Highland, call it Kodak Theater Sta. Don’t call it Pico Sta. call it Staples Center Sta. It’s much easier to remember and it’s much more obvious; oh Staples Center Sta. means that’s where the Staples Center is. Oh Kodak Theater Sta. means that’s where Kodak Theater is. See how simple that becomes? Looks like maze huh? But things are simplified because all the stations have letters and numbers assigned to them. Y means I take the Yurakucho Line, I’m at the 12th stop, Y-14 means it’s only two stops away, and the same station is also called S-04. S means Shinjuku Line and S-01 means it’s only three stops away. Having been to Hong Kong and having ridden the MTR rail system, I have to say that it really is the best system I have ever ridden and should also serve as a model for LA (in terms of usability, connections and operation of the system) I know there are certainly geographical differences between the two cities, but that’s more of a matter of alignment of the lines than anything else. Its very similar to London’s system as described in terms of accessibility, features and destination points which is, well, really really good on MTR. (LAs system should be more of a grid-like metro rather than spoke and wheel like most American cities). MTR is also a private-public partnership and Metro is not and I think that is part of the problem here. We need to start considering the possibility of Metro’s structural change (as well as other American transit operators) as a way to help the system grow and maintain revenue better. Its not just Hong Kong that does this either, almost every Asian city does this, why cant we? Have been Taipei (20 years ago though), Hong Kong, D.C., San Francisco, and Vancouver, I really hate LA public transportation system. Looks like, every time LA is making improvement, it makes worst. Let me correction, it makes happier for the people who drive car. In LA, there is no such thing as duplicate or excessive service, but MTA kept defining. In Hong Kong, there are light rails connecting Hong Kong, Kwoloon, and New territory. In Hong Kong, people can take subway or buses (since RAILROADS CANNOT REACH EVERYWHERE. FOR BUS HATER/RAIL SUPPORTERS, DO THEY GET IT?). There are also some “long distance” buses (similar to 400 that MTA is killing) which supplement the routes that light rail cannot reach. There are some private companies providing shuttle services. of course, there are taxi in case people don’t want to struggle the buses or have hard time using the public transportation after midnight. Hong Kong is the public transportation friendly place. I hard cars are expensive. Even if you are rich enough to buy a car, you need extra money to buy parking space around your apartment. Then parking everywhere in HK is also expensive. I have not had the chance to visit Taipei for a while. People love the subway, but people still take bus as connection that are not reachable. During last year election, some politicians promised subway connection from a city in middle Taiwan to somewhere. It was fired back and mention it was waste money, and probably more cost efficient to improve the bus service (remember Gold Line Foothill). To get to her work, my cousin still takes the same bus that we took when we visit her home 20 years ago. In LA, MTA starts to remove the essential bus service even before the rail complete, and the ones that got removed are not even duplicated and excessive. Waiting for a bus is pain. Transfer to a bus is pain. Taking the train is fun, but transfer between train and buses are painful. LA is decades behind most major cities. Unfortunately, its improvement is car driver driven. There should be more frequency of buses that are not reachable by buses (which is majority of area in LA). There should be more bus routes. In between each rail station, there should be some good local connections. While Fred is writing the review for London system, do you realize that the pain of the public transit riders? Do you realize why many bus riders wish they could drive? Do you realize would never switch to public transportation. It is hard for MTA staff to understand. It is also hard for Rail only supporters to understand. They envy the system in Tokyo, Paris, and London. Remember, there is hardly gap/infrequent service in those cities.